Surgical Robots Market size is set to exceed USD 24 billion by 2025; according to a new research report by Global Market Insights. Large patient pool suffering from chronic diseases in developed as well as developing countries will drive the demand for robotics in surgical procedures. Increase in number of surgeries owing to rising prevalence of chronic diseases will spur the surgical robot’s business revenue. Growing patient preference towards minimally invasive procedures to prevent post-operative trauma and complications will foster surgical robots market growth during the forecast period. Other advantages associated with minimally invasive surgeries such as smaller incision length, less blood loss during the surgery, reduced discomfort, and shorter hospital stay will increase the demand for surgical procedures, thereby fueling industry growth over the coming years. Growing demand for minimally invasive surgeries will lead to development of technologically advanced surgical robots thereby, fostering business growth in the foreseeable future. For instance, Intuitive Surgical have developed da Vinci single site technology that provides multiport, single incision surgical procedures, thereby enhancing its acceptability among physicians and patients. High accuracy level and increased reliability offered by surgical robots owing to technological advancements will positively impact industry growth. However, high cost of surgical robots may hamper industry growth in developing and underdeveloped countries during the forecast timeline. Robot systems segment held significant revenue share in 2018 and is anticipated to witness over 24.5% CAGR by 2025. Segment growth is attributable to technological advancements in robotics resulting in wide applicability in various surgical procedures. Focus of industry players on frequent upgradation of technology allows introduction of innovative and advanced robotics capable of performing more complex surgical procedures with minimal efforts and high precision. Such factors should accelerate the segment growth over forthcoming years. Gynecology application segment accounted for more than 17% revenue share in 2018 and will show similar growth in the foreseeable future. Segment growth is attributed to introduction of robot-assistance in the field of gynecological surgeries such as hysterectomy, abdominal myomectomy, tubal reanastomoses, radical hysterectomy, lymph node dissections, and sacrocolpopexies. Growing patient preference towards robotic approach to overcome shortcomings of conventional suture-intensive gynecological surgeries will increase adoption of robot-assisted minimally invasive procedures, thereby accelerating segment growth. Ambulatory surgical centers (ASCs) segment was valued more than USD 1.5 billion in 2018 owing to increasing patient preference towards ambulatory surgical centers that offer minimally invasive procedures. Various robot-assisted procedures such as cardiac, urology, gynecology as well as other general surgeries performed in these centers at affordable prices will favor segment growth during the forthcoming years. 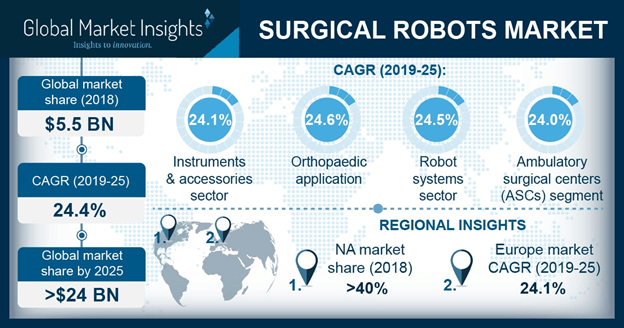 North America surgical robots market witnessed over 40% revenue share in 2018 and is anticipated to grow substantially over the analysis timeframe. Increasing healthcare expenditure in the region coupled with increasing demand for technologically advanced surgical procedures will drive the North America surgical robots industry growth. Strong foothold of key industry players in the region focusing on technology upgradation will favor business growth. For instance, in January 2019, Zimmer Biomet introduced Rosa Knee system, a robotically-assisted total knee replacement surgery platform, that offers 3D pre-operative planning tools as well as real-time intraoperative data. . Increasing adoption of such advanced technologies will boost the regional industry growth. Eminent industry players operational in surgical robots market includes Accuray, Globus Medical, Hansen Medical, Intutive Surgical, Johnson & Johnson, Mazor Robotics, Omni, Stryker, Think Surgical and Zimmer Biomet. These industry players adopt strategies such as geographic expansion, partnerships, merger and novel product launch to sustain market competition. For instance, in September 2017, Think Surgical entered South Korean market with its TSolution One Surgical System, used in Total Knee Arthroplasty (TKA) cases. The strategy aimed at increasing company’s geographical reach and broadening existing customer base.